Fearrington House Inn in Pittsboro, North Carolina is an enchanting and very special place just minutes from Chapel Hill. This Relais & Chateux property offers the perfect mix of relaxation, elegance and gourmet food, thanks in part to their Executive Chef, Colin Bedford. We were excited to be able to sit down following our Culinary Class in August to learn more about his background, philosophy on cooking and techniques that he uses in the kitchen. Reared in England and trained in culinary school in the United Kingdom, Chef Bedford’s background is a little different from the other chefs we have met and interviewed. After culinary school, Bedford apprenticed at The Castle Hotel in the UK, which is very much like Fearrington in that it is a small luxury property owned and run by one family. Its restaurant has one Michelin star and is known as a training ground for up and coming chefs. 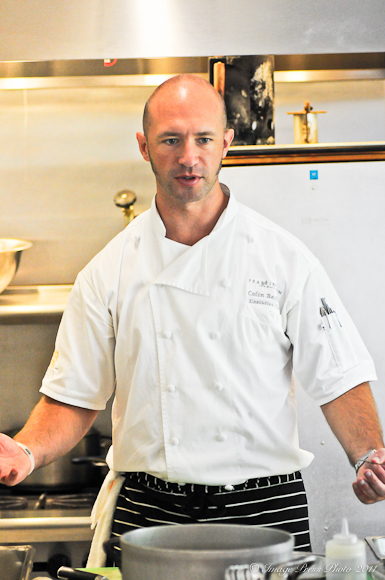 From there, Chef Bedford traveled to work in Ontario, Canada at The Prince of Wales Hotel where he quickly was promoted to Executive Sous Chef. 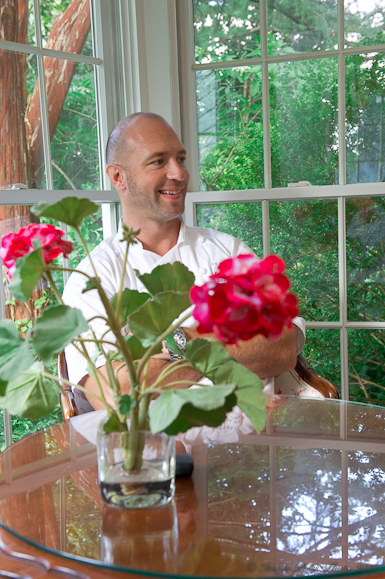 He then came to Fearrington House Inn in 2005 and by 2009 had earned the position of Executive Chef. 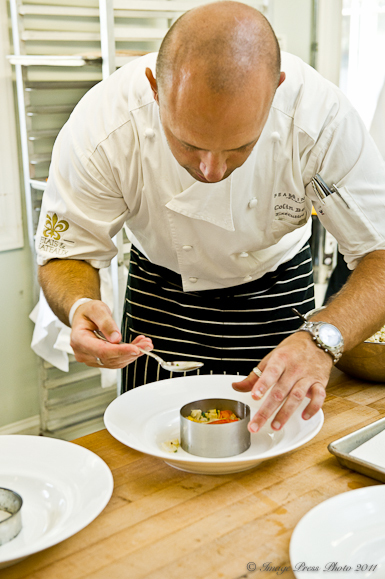 We thoroughly enjoyed Chef Bedford’s creative menus and exceptional flavors during our stay at Fearrington House Inn. When we dine out, we look for chefs that use local ingredients and create layers of flavor through their culinary techniques. This is exactly what Chef Bedford does at Fearrington House Inn. In fact, Fearrington House has received many awards and accolades, including the Top Ten hotels for food in North America by Condé Nast Traveler: Gold List 2011, No. 2 Best Small Hotel in the U.S. by Condé Nast Traveler and a Gold Medalist restaurant in 2011 (News & Observer). A firm believer in using local ingredients and supporting smaller farmers whenever possible, Chef Bedford buys the best ingredients he can find. 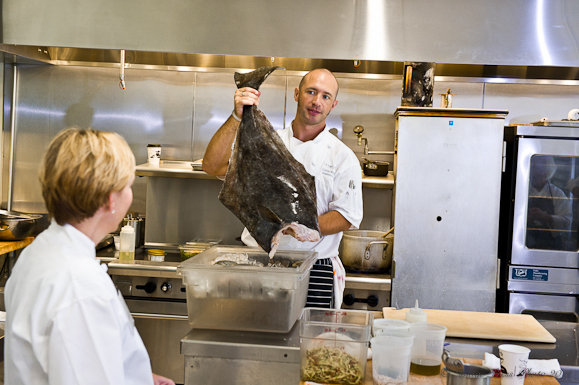 He also prepares only non-endangered and sustainable seafood in his kitchen. This chef is concerned that when the new Farm Bill is implemented next year it could definitely cause a shift in what he can purchase and where it will come from. In the Farm Bill, chefs and farmers will be required to provide extensive information about the foods they produce and use. The new regulations will be much stricter and will place a higher burden on the small producers as they lack many of the tracking systems that will be required. The Farm Bill will favor corporate farmers with extensive systems and economies of scale. He hopes that there will be some grandfather clause that will protect some of his suppliers and that health inspectors will not be so harsh. As he said, all it will take is one incident where someone falls ill and they can’t trace it back to the specific supplier and there will be a major backlash. Bedford feels that the “Farm to Table” philosophy is reaching a saturation point. He thinks there will be a new culinary trend that is far more eclectic and possibly driven by dietary preferences and restrictions. Guests will sometimes arrive at Fearrington House with a list of fifteen ingredients that they cannot eat. He said that while it is difficult, he is in the business of customer service and has to facilitate these requests. The question is – is this just a dislike or a true allergy? People will claim they are lactose intolerant and he will prepare dishes based on that restriction, but then they will eat Panna Cotta for dessert. I couldn’t help but laugh when he said, “I want a pharmacist on staff. Here is a pill. Eat your dinner.” I don’t know how you accommodate all of these restrictions on a much larger scale (like a wedding reception) and still make everyone happy. Restaurants catering to all of these dietary needs, restrictions or requests may be the next big trend as more people seem to be gluten or lactose intolerant, want to avoid certain foods or are allergic to certain ingredients. Thank you for your comment. Yes, we always prefer to buy from the local and smaller farmers when we can. I guess we will all have to wait and see what happens when the Farm Bill is implemented next year. Unfortunately, it may have far reaching implications to buying local foods from smaller producers. Gelatine (or gelatin) leaves are used more in Europe, but you can find them in the U.S. (Amazon.com is one source). You can substitute regular gelatin in the recipe or Agar-Agar (if you are vegetarian) and will have to convert the measurement, depending on what you use. I gave the chef’s recipe as it was written, so there was no confusion in the conversion. What a great post. I love his way of thinking, his philosophy….and also his view of the way people now are allergic to so many things and have special diets when it suits them. Where are the good old days when people actually enjoyed their food, found pleasure without fear and guilt? That said, his food looks and sounds fabulous and I would so love to eat there. And take a class with him if I could. This panna cotta is outstanding, and you know how we love our panna cotta here. Beautiful weekend and write up(s) Gwen. Thank you, Jamie. I agree about the food allergies. Yes, some people are truly allergic to foods, however, I have personally run into this situation at my home where people eat what they want, not adhering to the “intolerance” they say they have. It will be interesting to see where all this goes, especially as more people cut certain foods out of their diet, for whatever the reason. The panna cotta is delightful. I love the subtle flavor of the lemon thyme with the lightness of the yogurt/half and half combination. It is a great recipe. Love this post, Gwen. 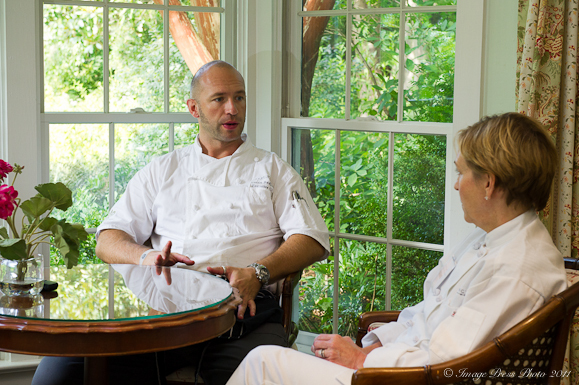 Your interview w/Chef Bedford is great and informative. I think people always had food allergies but are now more vocal about it when they dine out. Even more prevalent (I think)when they go to a nicer establishment. It gets very complicated for a chef on a busy night when they have to deal w/ many accommodations. Those that have severe allergies most likely don’t risk going out or if they do, may even bring their own meal to be safe. That panna cotta looks divine!!! Dear Gwen – What a great post and that panna cotta looks absolutely divine. Hi Gwen, Another wonderful trip, thanks for taking us along with you. Chef sounds like an amazing person in addition to his fabulous culinary talent!. His tips are well take, especially the logistics point. I know how true that is having a big family and a small kitchen! I worry not only for the farmers but also for all of the small businesses across our nation. These new regulations are nothing more than “big brother” power plays. The idea is to crush small business hoping we will change our self-reliant responsible minds and depend upon them to live….. I say Bull Snitz to that and am hoping 2012 will bring us like-minded leaders!!! That panna cotta sounds mighty delicious but its that perfectly cooked halibut that has me drooling! Gwen, a very good interview with one of my favorite chefs. As a repeat student in his cooking school I can testify he is the real thing. On my next visit I am going to bring a list of 15 things I WANT to eat. Please continue to inform us on the Farm Bill’s impact on great chefs selections. Thank you for your thoughtful comment. I agree, Colin is extremely talented and our class was both informative AND fun. You cannot ask for more than that. I came away from our class with a number of great tips and the food we prepared was incredible. It will be interesting to see how the Farm Bill impacts the chefs that use more local ingredients from smaller farmers. I recently attended a huge produce convention here in Atlanta that had both smaller and larger produce farmers and manufacturers. Many of them are already implementing the QR-Barcode, which tells consumers exactly where their food comes from just by taking a scan of the code with their phones. Obviously, this will be a bigger burden to smaller farmers.